Ohio in the Civil War With five army camps in Columbus, Capitol Square was a military crossroads from 1861 to 1865. Ohio troops were mustered, paid, and on some occasions garrisoned at the Statehouse. Three of every five male Ohioans between the ages of 18 and 45 served in the Civil War. Ohio's contribution to the war effort was enormous, supplying almost 320,000 soldiers to the Union Army, representing 230 regiments and 26 independent artillery batteries. More than 35,000 soldiers died during the war, and 30,000 more were disabled. One hundred forty-eight Ohio soldiers received the Congressional Medal of Honor for valor. 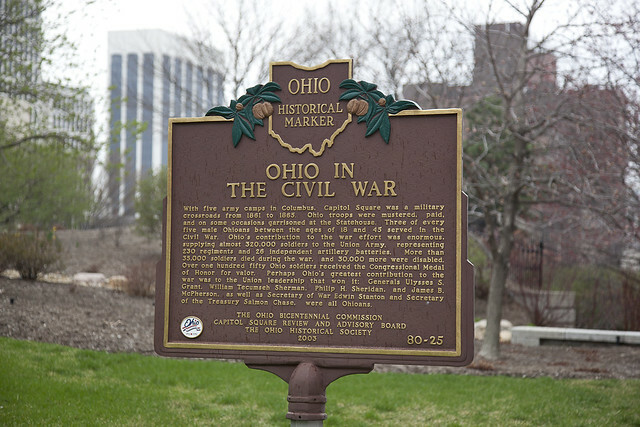 Perhaps Ohio's greatest contribution to the war was to the Union leadership that won it: Generals Ulysses S. Grant, William Tecumseh Sherman, Philip H. Sheridan, and James B. McPherson, as well as Secretary of War Edwin Stanton and Secretary of the Treasury Salmon Chase, were all Ohioans.